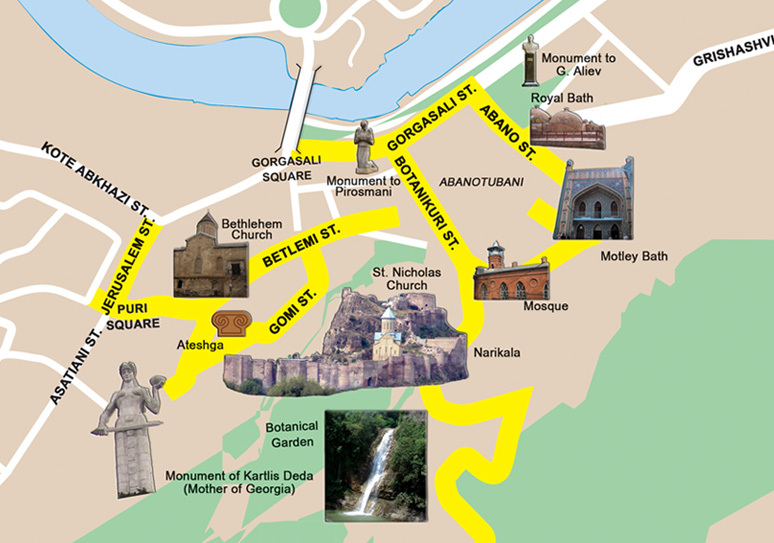 Our second tourist route begins with Aba-notubani (bath quarter), where we can get from Gorgasali Square to the street of the same name and it is an area of functio-ning sulfur baths, from which the constru-ction of the Georgian capital practically be-gan. 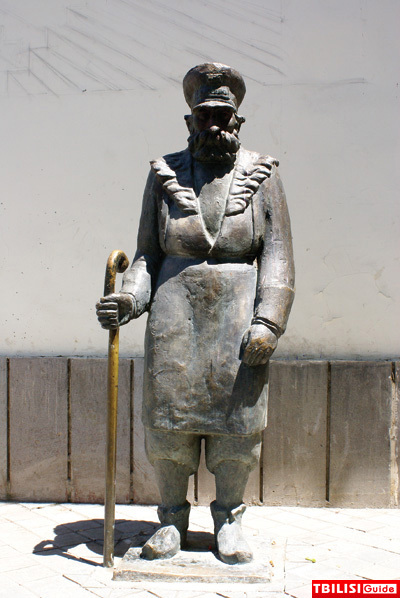 According to the legend, sulfur spri-ngs were discovered by the Georgian king Vakhtang Gorgasali during hunting. The springs flew out of Tabor mountain. The quarter itself has several names. 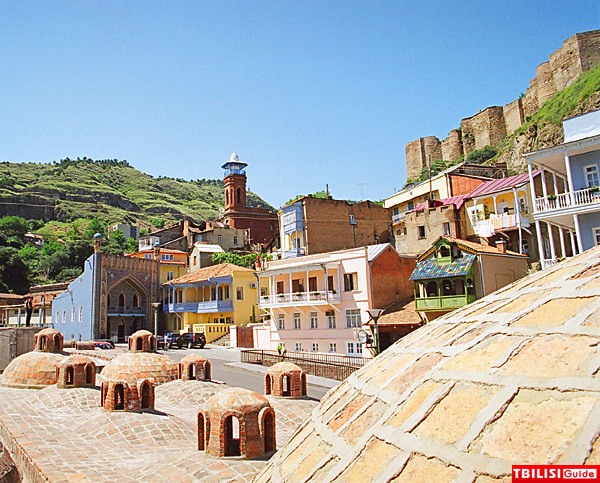 At first it got the name of Tbilisi, as the city is called now. And in reality, the city arose from it. In the 17th century a tribe of seids got the-re from Persia and since then this region was called Seid-abad ("seid-abad" means "a settlement of seids"). Later, at the be-ginning of the 18th century the quarter got the name of Kharpukhi, which means "a cold". According to the legend, one of the fugitives, having caught a cold, touched a stone near Bath Gates with his nose and after that his cold disappeared. The citi-zens of whole town began pilgrimage the-re to cure from colds. In fact, Kharpukhi is not only Bath Quarter, but the whole area between Seid-abad and Ortachala, a vil-lage of the same name at the slopes of the mountain Tabor. Soon this area got the name of Abanotubani. 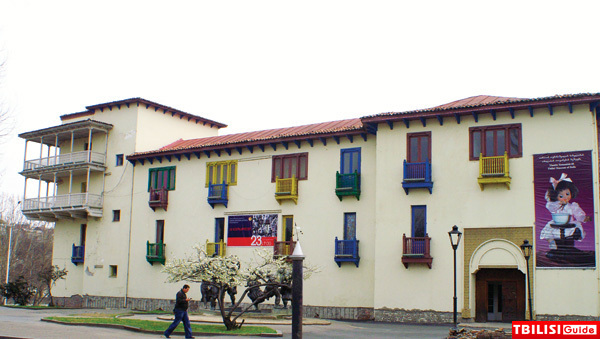 On the whole, the bath quarter consists of two streets: to the right - Botanical and to the left - Grishashvili. 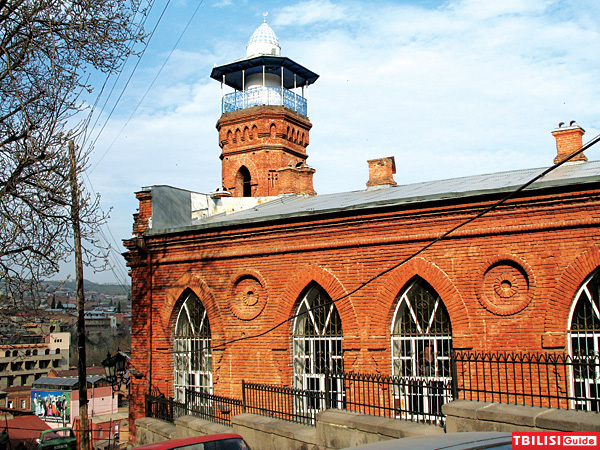 The main baths face Grishashvili street, which is parallel to the embankment, but somewhat higher than it. The street is separated from the Mtkvari river by dwelling houses and other const-ructions. There, where the Bath area begins, in the middle of a green grass-plot on low flat foundations there is a monument to Niko Pirosmanashvili (Niko Pirosmanashvili, generally known as Niko Pirosmani (1862-1918) was a Georgian primitivist painter.). The knelt, bear-footed artist presses a helpless lamb to his breast (sculptor E. Amashukeli, 1975). .
Tbilisi has long been famous for the natu-ral piping-hot sulphur water that bubbles out of the ground along the banks of the Mtkvari River. The oldest bath is the Ere-kle's Bath. Orbeliani (blue) bath with an arrow-like facade and minarets on its side is distinguished from the baths located on Abano (bath) street. It is also called "Chre-li abano" (motley bath), as it got its name because of the motley tiles covered the portal. It was redecorated in the eastern manner in the second half of the 19th cen-tury. The plaque to the left of them reveals the thoughts of Great Russian writer Ale-xander Pushkin: "I have never in my life co-me across anything better than baths in Tiflis". "A great sense of freedom and well-being permeated me. All my tiredness had gone and I felt strong enough to lift a mountain" - Alexandre Dumas, after a visit to the sulphur baths in 1858. A hundred years later Russian writer Alexey Tolstoy said, that "when sitting in a marble swim-ming-pool a man feels like either Pompey or Lucullus". All the baths are below the ground level and are overlapped by semi-circular do-mes and are naturally lit via a glass lan-tern over the cupola. In ancient times peo-ple could have a bath whenever they liked and could stay in the bath till dawn. The ci-tizens used to spend their leisure time, gave formal dinner-parties and went on the spree in the baths. Women were allo-wed only on special days. Town match-makers often arranged bride-shows there. 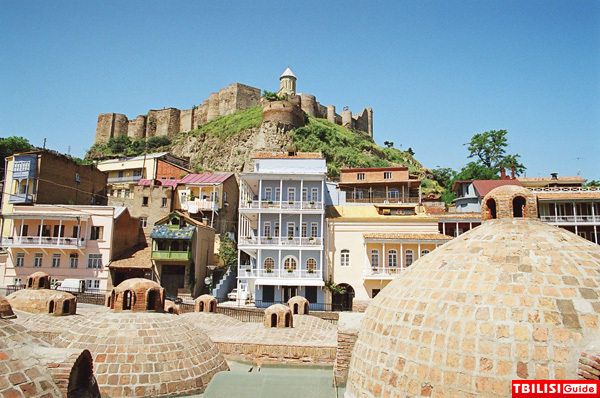 Fed by naturally hot mineral waters, the sulphur baths have been an essential part of Tbilisi life for centuries. Why not come and try it for yourself? Botanical street with its narrow blind al-leys and stepped yards is rather typical for a street going up a mountainous relief. At the turn of the street, in its middle part there is the only functioning mosque with a minaret under the white and blue cupo-la, which was built in 1864 on the spot where an old mosque used to be. Before the Soviet occupation there was another mosque in Tbilisi - a Shiite one, built by Shah Abbas close to Metekhi bridge, but it was destroyed in 1950. Since then Tbili-si Moslems have performed Mohamme-dan prayers in the Sunnite mosque. This is an unprecedented case when in spite of historic opposition Shiites and Sunnites go to pray into the same mosque. Behind the mosque spreads Tbilisi Bota-nical Garden for many square miles along. It is located in the gorge Tsavkis-Tskali, bet-ween Tabor and Sololaki Ranges and on their slopes. The Garden was established on the basis of the palace ("fortress") gar-den existing since 1625. All the year ro-und one can see there unusual beautiful plants, falls at the height of 40 meters and a small bridge across the river with won-derful flowers. Another main entrance is in Asatiani street between the houses #28 & #30 and it represents a tunnel going into the garden. 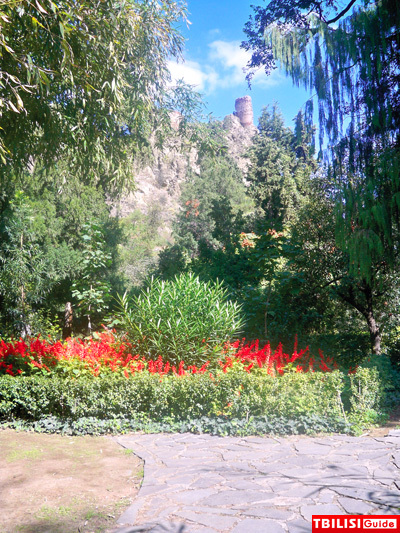 At the peak of Sololaki Range there are ruins of Narikala ("impregnable fortress"). Whenever you go around old Tbilisi - you can see it everywhere. The spot for fort-ress construction was chosen extremely successfully: the road along the riverbed Mtkvari is shot from all sides. Judging by such a location, it becomes clear, that Tbi-lisi was set up as a military base to control the road. The unique strategic position was taken into consideration by both local ru-lers and foreign conquerors, and both of them turned Narikala into their residence and headquarters. One can see here, that the fortress is on the top of the mountain and it "slides" down, to a smaller peak. The technique of the wall construction is astounding - powerful cobble-stones re-surveyed by huge bricks. Some places of its towers are intricately decorated with bricks. The wall merlons have not been preserved everywhere. Under the fortress there is a single tower, which might have been served as an entrance. This tower nearly descends to the quarter of warm springs. In the system of fortification cons-tructions dominates a tall four-angle don-jon - Istanbul tower with crumbled top. It was erected in the second half of the 16th century and got its name "Istanbul tower" within a short period of Turkish domina-tion, when Turks imprisoned unsubdued citizens there. On its western side coming to a single gentle slope of the crest there is a powerful frame of a tower fort Shah-Takhti ("throne of shah" in Persian). In the 7-9th centuries an Observatory was held there. The appearance of this citadel is referred to the 4th century after Christ. Earlier the fortress was called Shuris Tsi-khe ("fortress of envy"). 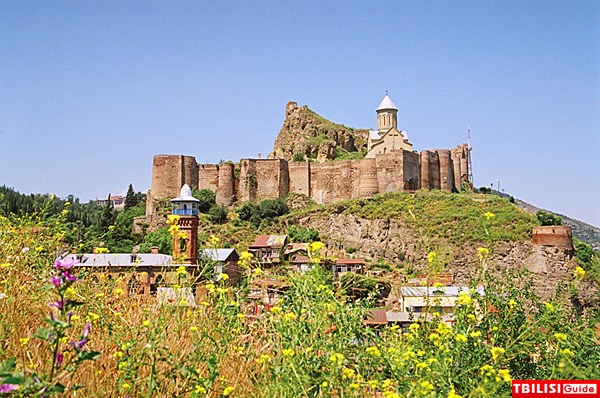 Its present name - "Narikala" - the fortress received during Mongols' invasion and it ( the name) co-mes from "Narin-Kala", where the word "kala" is of Arabian origin and means "for-tress, fortification", Tatar "kale" ("rock, for-tress") and Mongolian "narin" ("minor") - i.e. Minor Fortress. The citadel was built by the order of Vakhtang Gorgasali (4-5th centuries). But it was considerably increa-sed by Arabs in 7-8th centuries. In the ci-tadel itself, in its lower part, there is Saint Nicholas Temple. It appeared at the edge of the 12-13 centuries and has been rece-ntly fully reconstructed. The temple on the site of its present construction existed sin-ce 1122 as minimum, when David the Buil-der entered the residence of the former emir. And before that there might have been Emir' mosque on the temple's spot. A promenade alley (Sololaki one), paved along the ridge in 1935, rests the ruins of Narikala fortress. 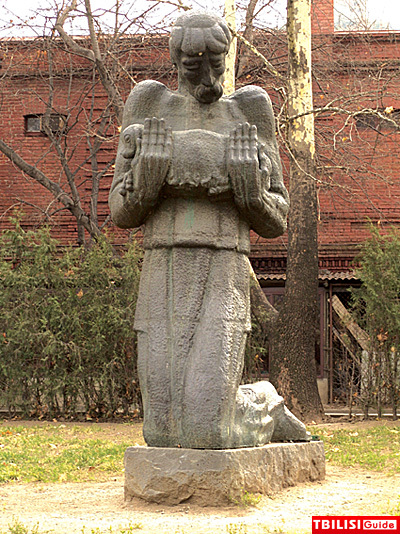 There is a gigantic sta-tue of Mother Georgia, Symbol of the na-tion's legendary spirit. 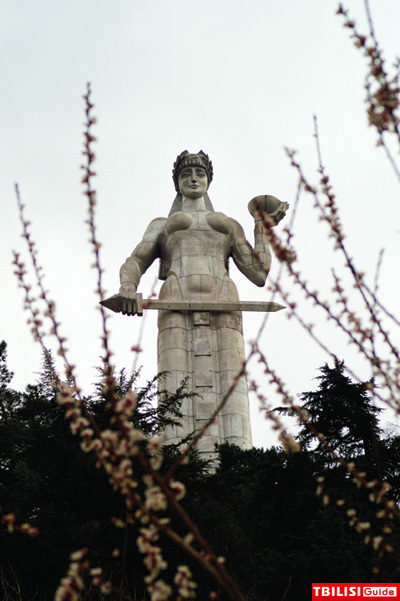 High on a pineco-vered hill above Tbilisi, the 65-foot woman holds a bowl of wine in one hand and a sword in the other. Centuries of invasions and foreign occupation have taught Geor-gians that the best defense is treating all outsiders as guests, feeding them and flat-tering them with toasts until everyone gets along like old friends. The cup in her left hand is filled with Georgian wine for fri-ends, but the sword in the right is a war-ning to enemies. It was designed as a sy-mbol of the nation by Elguja Amashukeli and put up in 1958. Near the monument of the "Kartlis Deda" hardly more to the right from Narikala, ru-ins of a brick vaulted structure are kept. The temple of Fire-admirers was standing there. The temple was called Ateshgah. This name occurs from the Persian words "atesh kadey" that means a temple of fire. 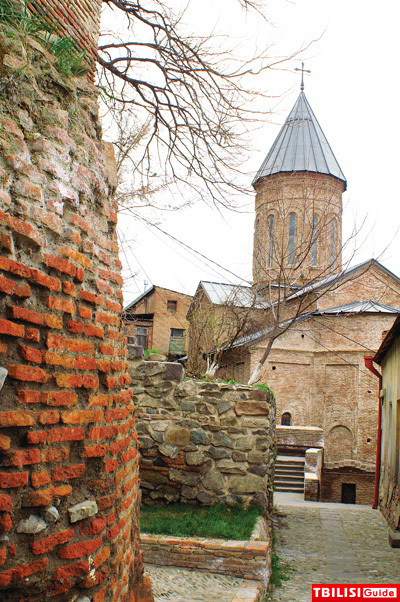 Ateshgah was founded in the 5th century. In King Vakhtang Gorgasali's period it was known that Persians were Fire-ad-mirers. Arabians as well as Persians who invaded after them were already Muslims; nevertheless the temple was not touched possibly because of superstitious horror and not because of the desire to keep an ancient monument; however the interdic-tion was broken approximately in 1720 by the Turkish, who were mocked above the temple. Here opinions are divided: some people say that they completely broke the construction and erected the mosque ins-tead. Anyhow after the Turks exile the mo-sque was destroyed and ancient ruins we-re left by themselves. For centuries this construction had lost its function. Atesh-gah as the monument of the ancient peri-od was protected by the Georgian kings. This fact is a graphic evidence of old tra-dition of religious tolerance and a wise state policy certain by good understan-ding of historical validity of the country. At the foot of Narikala fortress, from the northern side, in the quarter of Kldis Uba-ni (meaning "a quarter of rock") there is Be-thlehem church. Bethlehem Church was founded in the fifth century when King Va-khtang Gorgasali rained. The church has been reconstructed numerous times, which basically changed its original aspects. Ge-orgian autocephalous after being abolis-hed by Russian, church Bethlehem was bought by the Armenians and nun-mo-nastery was founded there instead, but la-ter being left without any function the church was given back to Georgian Pa-triarchy. Here begins a street-staircase, characteri-stic for Kldis Ubani, which Tbilisi citizens call Petkhain. The project of this staircase was designed by a province architect T. Beloy in 1850. Descending Petkhain stair-case, we find ourselves in Asatiani street. At Puris Moedani ("bread square") we pass on to Jerusalem street. Via a short street of Jerusalem we can get to the section of Kote Abkhazi street, near the territory, on which there are two churches in the immedi-ate proximity - Jvaris Mama and Norashen.